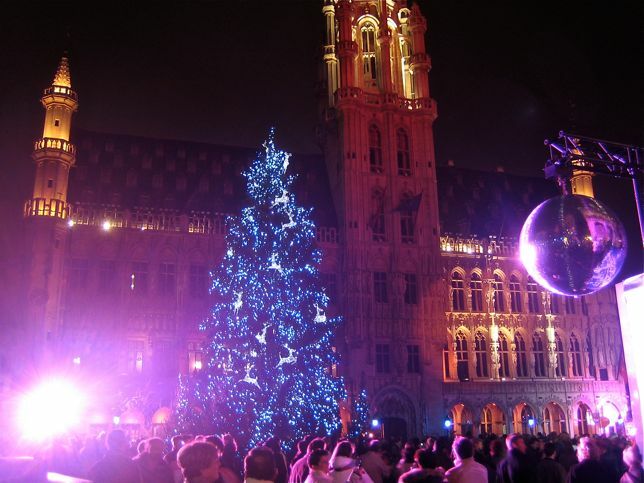 These Christmassy photos from a December trip to Belgium originally featured on Maison Cupcake. The great thing about a weekend getaway to Brussels is that the hotels are such good value. As the centre of the European Parliament, the hotels are expensive during the week when all the bureaucrats are about. Come Saturday night they’ve all gone home and the hotels are selling off their rooms very cheaply. That’s not to say Brussels isn’t a place for tourists, December especially sees the streets surrounding the Grand Place filled with atmospheric Christmas Markets. You can get a very good four star hotel room in the centre of Brussels for under £100 per night including breakfast, we booked Hotel Windsor using lastminute.com. We had driven from the UK and parked overnight in an underground car park near the Grand Place for around 12 euros. This was 4 years ago now but I have been researching trips to Belgium more recently and know this hotel at weekend would be phenomenally good value even now. Bruges on the other hand, is very pricey, very difficult to book at weekends near Christmas since its proximity to Calais makes it very busy for “booze cruisers”. Brussels is worth the extra hour’s drive. We were able to leave Brussels at around 4pm on Sunday and using Eurotunnel still be home for a reasonable 9pm and not be too tired for work the following day. In the hotel lobby, we were captivated by this village of gingerbread houses. I vowed to make one myself but to this day have not yet managed to do so. The lobby was filled with smell of gingerbread, it was so welcoming. I think these are the best gingerbread houses I have ever seen. As a food blogger, taking this many pictures would be normal but this was a long time before so that gives you an idea what an impression they made on me!